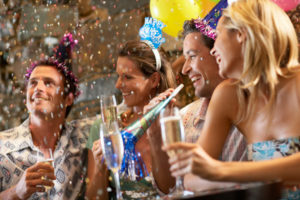 EC Pops has all the stuff you need for a great New Year’s Eve Party! We know, you just got done with the craziness of the holidays, and now you have to plan another party. Fear not! EC Pops has all the stuff you need for a great New Year’s Eve Party. We also have plenty of things you don’t actually need, but will probably get anyway because they’re so unique and fun! The only thing you have to worry about is getting the house cleaned up, or not, no judgment here. Wings! They’re the preferred food of tipsy people everywhere! EC Pops has a whole bunch of sauces so you can make wings that everyone will like. We have barbecue sauces, hot sauces ranging from mild to melt-your-face-off, and dipping sauce for those who don’t like barbecue or hot sauce. Bloody Marys… Need We Say More? While you’re here, pick up a bottle (or 2, or 3, or 5, we won’t judge) of our Bloody Mary mix. Don’t like Bloody Marys? We’re sorry for your loss but we are super sure to help you find a little something else to help you celebrate the new year, so come on by! It’s Always a Party Here! If you’re walking down Main Street in the evenings or on the weekends, come see for yourself. There’s always a party happening at EC Pops! We like to turn up the music, dance, and have a good time. If that’s not your scene we’ll miss you, but you can still go home and order popcorn online. EC Pops is a gourmet popcorn purveyor owned and operated in Ellicott City, Maryland. We are proud to offer the best gourmet popcorn, locally-sourced sweets, delightful sodas, and gifts that the whole family can enjoy. Enjoy our popcorn wherever you are with bagged popcorn delivered straight to your door. If you’re ready for a taste of Maryland’s favorite popcorn, visit our charming storefront to taste it for yourself. Our store is packed to the brim with your childhood favorites and modern twists on the classics including handcrafted gourmet popcorn, homemade fudge, Route One Apparel, and fun gifts. EC Pops always has at least 50 flavors in stock ranging from Great Garlic and Parmesan to Sea Salt Caramel — and you’ll get to try every last one! Have any questions? Give us a call at 410-750-POPS (7677) or email info@ecpops.com. This entry was posted on Tuesday, December 26th, 2017 at 10:39 am. Both comments and pings are currently closed.